What once-loved but now discarded items lurk in the depths of your garage? A Ken Done jumper? Wham! records? A tyre swan that once graced your grandmother's front yard? While it's hard to believe that any of these things could actually come back into fashion, remember "One man's trash..." and all that. 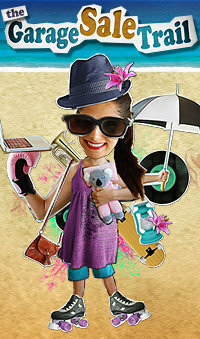 Don't miss your opportunity to offload or purchase some priceless pearls from the past when The Garage Sale Trail, the ultimate recycling community event, comes to a garage near you on Saturday 5 May 2012. [ADVERT]The Garage Sale Trail is the product of one of those "what if?" moments for Sydney residents Darryl Nichols and Andrew Valder. 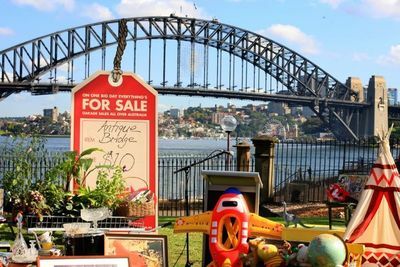 It began on a local scale as part of the 2010 Sizzle Bondi Community Festival when 126 garage sales took place. But the "what ifs" grew from there. There are more than 7 million garages in Australia. What if everyone held their garage sale on the same day? 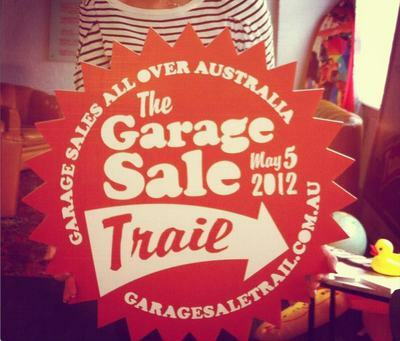 So with the support of local councils, business sponsors and celebrity ambassadors, in 2011 more than 1600 garage sales were held around the country, selling 73,000 items and ensuring an estimated 55,000 kilograms of stuff didn't end up in landfill. In 2012 celebrity ambassadors include landscape architect and TV host Brendan Moar, fashion designer Marnie Skillings, interior designer Liane Rossler and singer Angus Stone. Households, schools, community centres and businesses from Ballarat to Beaconsfield and Adelaide to Albany Creek have already signed on with more coming on board every day. So what are you waiting for? Clean out your unwanted items, do yourself, your neighbours, and the environment a favour and add your sale to the trail. The event is a focus for sustainability, community building, fund-raising and small business. Organisers describe it as an "organisational framework that enables the peer-to-peer exchange of assets, resources and money on a hyper local level but with national scale". Here! Here! You can give your sale a catchy name and register it on the website here. All the information you'll need can be found on the website or the event's Facebook page here. You can download some artwork to advertise your sale, find sales near you or anywhere in Australia, and give yourself a head start by checking out the most watched sales and items. If you can't bear to part with your treasured trash then participate as a bargain-hunting, haggling buyer instead or donate to the Garage Sale Foundation. Treasure, trash and talk. It all comes together in suburbs around Australia on Saturday 5 May at a garage near you. Why? It's the ultimate community recycling event. When: Saturday 5 May 2012. Where: At a garage, school, community centre or business near you. Cost: As a seller - time and effort. As a buyer - whatever you're prepared to pay. This is a great initiative. Had some fun this morning picking up a few goodies. Lets hope the City of Sydney make it an annual event.